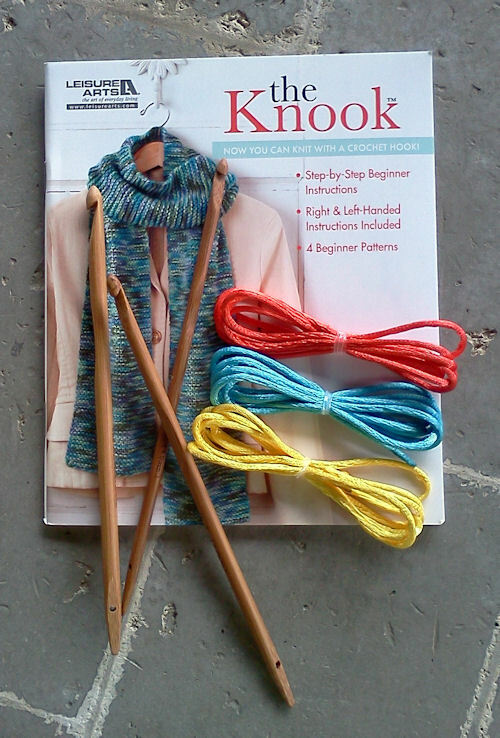 Knooking is a great tool for crocheters who have had difficulty learning to knit because of the two needles that are required. With knooking, you hold the yarn and the piece you are working on the same way as when you are crocheting. The cord attached through the end of the hook holds the stitches together instead of a solid needle. 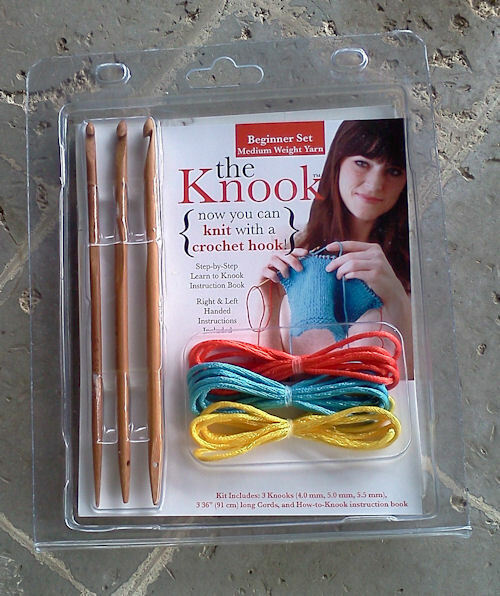 The Knook is a kit available from Leisure Arts that allows you to knit using a crochet hook. The kit includes three bamboo crochet hooks (sizes G/6, H/8, and I/9), three colored cords (36″ long), and an instruction booklet. The hooks are tapered down at the end of the hook with a hole near the end. A cord is inserted into the hole to hold the stitches in order to turn the work. Once a row is completed, the stitches are moved from the hook to the cord so there is no worry about dropping the stitches. The next row is made by working into the stitches that are held on the cord. I did find that some of the ends of the cords (which are slightly melted to hold the strands together) were too large to go through the hole in the end of the hook. As a result, I cut a 36″ length of crochet thread to use instead. Whatever cord you use, make sure you use one that contrasts against the yarn you are using so that you can see the stitches against the cord. I also found that the bamboo hooks weren’t as smooth as the ones I’m used to from Brittany and other companies so fuzzy yarns tend to catch on the hooks. This doesn’t mean you can’t use fuzzy yarns, just be aware that you’ll need to push the yarn down the hook a little more than with a slicker type of yarn. 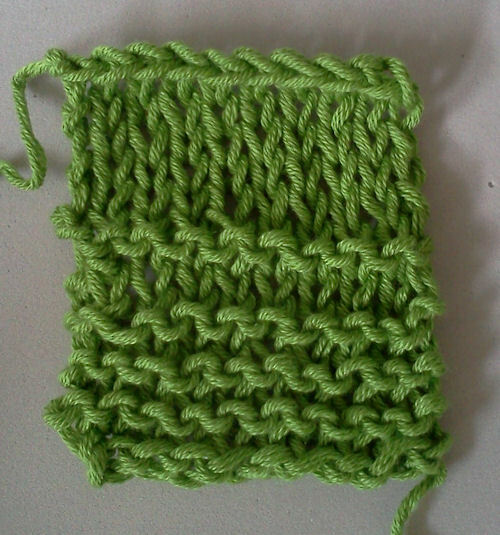 The instruction manual includes instructions on casting on and making the knit and purl stitches. It includes instructions for both left and right handed users and four beginner patterns: Infinity Scarf, Spa Cloth, Baby Blanket, and Diamond Lap Throw. The patterns only use knit and purl stitches so they provide plenty of practice before you learn more stitches from more advanced knitting patterns. In addition, Leisure Arts has several videos available so you can see how knooking is actually done. Just click on the link at the top of this review to go directly to the page with the videos on it. They also have some additional free patterns available as well as some reasonably priced ones for sale. Once you are ready to move on, find patterns on Ravelry that incorporate a new technique to add to your repetoire. Just as with crochet, move from beginner to easy patterns until you’ve mastered the technique. I’m also wondering if smaller knooks could be made with steel hooks by adding a small wire loop on the end instead of drilling a hole on the side … hmmm ….